Butler County Residents will head to the polls Tuesday to vote on the Ad Valorem Tax bill that would help fund the Butler County School system. If passed, the tax increase is estimated to cost the average homeowner in Butler County around 3 dollars and 75 cents extra, per month. The increase would raise the property taxes to 18 mill, close to the state average. That is a six mill increase from where it currently stands. Strycker says, if passed, money raised from the property tax increase could be used to help decrease the Butler County School system’s debt. It would also be used to help provide the students additional learning resources and extracurricular activities. “Books, textbook resources, technology,” Strycker says. “There’s just a lot of curriculum needs that we have.” He also says the money could be used to add music, robotics teams, and other clubs. 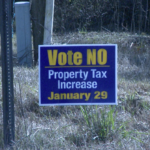 Residents have mixed emotions about the proposed property tax increase. Some say they plan to vote in favor of the bill. Other residents say they will be voting against the bill. Should the vote fail, Strycker says the school board will look for another way. Butler County School system ranks 132 out of 137 school districts in Alabama in terms of local funding support.